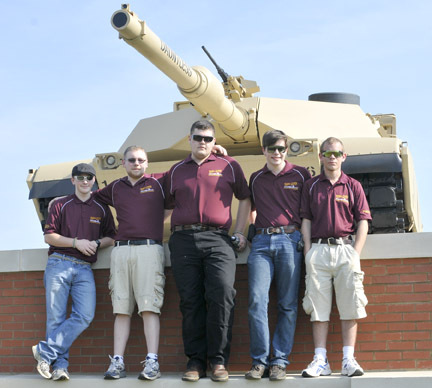 Currently rated as the fastest rimfire team in the country, the team claimed the SSC National Championship three years in a row — 2011, 2012, and 2013. They won the “junior/senior” individual title for SSC Production, the “collegiate” national team title, the SSC Rimfire title (both team and individual, led by Adam Thomas) plus a series of other individual titles along the way. Following USPSA’s bizarre decision to shut down SSC in January 2014, the team switched over to “Scholastic Pistol Program” and began adapting to its more-stringent rules. They finished second at the 2014 SPP Junior/Senior nationals, setting the individual course record in rimfire (Jordon Castro, 39.37) in the process, and putting three of its four members in the top five. From there, they went on to win the SPP Southwest Regional (out-shooting Texas A&M), where they set the all-ages team record. They beat the all-ages rimfire record AGAIN at the Washington State Championship in 2015. Please bear in mind, this group of high-school and junior-high kids set the ALL AGES 4-person rimfire record — out-shooting all other junior high, senior high, and COLLEGE teams nationwide. Following a victory at the Washington state, they completed a perfect season at the SPP Nationals. The team not only won “senior,” their second team placed third! And in typical style, they re-set the record yet again (165.66), an won both the high individual and high female trophies in the process. Team Captain Jordon Castro is one of three individuals (out of more than 1,000) to break the 40-second mark. He’s currently rated second-fastest nationwide, behind South Texas junior Ethan Inocando. While Taylor is head coach at the moment, a great many coaches and trainers have reached out to help Team Gotta be successful. Team founder Kim Gorham stands out, as does Tony Castro, Alan Thomas, Rob Neher, Tim Huff, John Romaska, John Kaye, Chris Nevins, and even USPSA Ladies champion Lisa Munson. Thanks to the generosity of Custer Sportsmens Club (and also Rainier Ballistics, Yeager’s Sporting Goods, Montana Gold Bullets, and Tenex), this Northwest Washington team has traveled to Georgia, Idaho, Oregon, Illinois, Texas, and eastern Washington to compete. They’ve been remarkably successful, securing not just a series of titles, but ~$35,000 in endowment prizes so far. Team Gotta is constantly recruiting, so if you’re interested in learning more, we urge you to contact Taylor directly at (360) 391-1551. The team needs sponsors and volunteers that can help make youth shooting competitions a reality. If that describes you, we look forward to talking to you soon. National Goal: We believe youth teams are the future of practical shooting in the United States. If you’re interested in starting a youth team like this in your area, Mr. Taylor would be all too happy to “show you the ropes” and help you get things started. Registration forms for the SPP Jr/Sr Nationals just came out. That match will be one of our major goals for 2014.